The Caspian Sea is one of the most magnificent sights in nature. The colors that shimmer across its surface are unbelievably stunning. Nature has put all the power of the two elements - earth and water to create one of the most fascinating natural resources, the bays. The Land of Fire is home to one of the most beautiful bays in the world. Baku Bay is a paradise bay in the Caspian Sea offering everything you need to spend a peaceful relaxing day. It is a gorgeous place to enjoy some of the best seaside holidays in Azerbaijan. 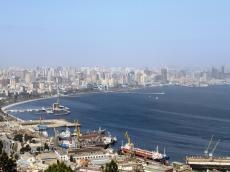 The bay, sheltered by the islands of the Baku Archipelago, provides the best harbour of the Caspian Sea. It is bordered by Sultan Cape in the east, Shikh Cape on the south-west and the islands of Qum, Dash Zira and Boyuk Zira in the south and south-east. These islands are part of the Baku Archipelago which lies mostly within the bay. Baku bay has been known since ancient times. It is mentioned in the works of ancient Greek, Roman, Arab and Iranian geographers and travelers. One of the earliest references related to the Baku coast is the information of the Byzantine author Prisca of Pontus in the first half of the fifth century. From the 1st century AD till the 7th century, Baku bay was dry and the islands in the bay joined the land. In Ptolemy’s map Baku was described far from the sea. After the 7th century the rising of water level of the Caspian Sea began and lasted till the 9th century, and since then formation of Baku bay began. In the end of the 8th century, the Caspian Sea raised up to more than ten meters. A major earthquake occurred in 1306. The Sabayil Castle, built on an island in the Bay of Baku, was submerged and remained under water for several centuries. The building complex, which is 40 meters long and 180 meters wide, consists of 15 semi-circular castles, 16 to 28 meters apart, connected by a wall. One of the castles at the four corners – the northern one – stood alone, but the others were connected via small cells. The wall was between 1.2 and 1.5 meters thick. The wall has individual stone panels with frieze inscriptions (70 cm long, 25-50 cm wide and 12-15 cm thick). From 1939-1969, an archaeological expedition organized by the Institute of History of the Azerbaijani Academy of Sciences, led by Prof Y. Pakhomov and archaeologists I. Jafarzade and O. Isimzade, discovered relics and, at different times, 699 inscribed stone panels. The stones are currently kept in the courtyard of the Sirvanshahs’ palace in the Old Town. Only in the early 18th century, the island resurfaced after the decrees of water level in the Caspian Sea. Beautiful scenery is just one of the many treasures one can enjoy in this place. Trade port is stretched along the northern and western shores of Baku bay. The port is fully re-equipped, all loading and unloading works in it are mechanized. The area of the Baku bay has a peculiar climate. The highest air temperature throughout the year is observed in the northwestern part of the bay and on the coast, where the central part of the city is located. The winds of the northern directions have the highest frequency throughout the year. The highest wind speeds are observed on the hill bordering the Baku Bay.